Why Do People Love Pluto? The New Horizons probe spotted a large, bright region on the surface of Pluto that's shaped like a heart. Pluto — the once (and to some people, forever) ninth planet of the solar system — gets a lot of love from the general public. What makes this icy outlier so loveable? When Pluto's official status in the solar system was changed from "planet" to "dwarf planet," the public outcry was overwhelming. Neil deGrasse Tyson received angry letters from kids who disagreed with the decision, and the majority of people still think Pluto should retain "planet" status. Pluto and its moons orbit the sun near the edge of our solar system. Learn all about Pluto's weirdly eccentric orbit, four moons and more in this Space.com infographic. One of the biggest reasons people love Pluto is that "It's mysterious, simple as that. The one planet we know very little about," wrote Facebook user Ashley Helton. Facebook user Sebastián Alejandro put that sentiment into poetic terms: "As Herman Melville wrote (and the great Carl Sagan once quoted), 'I am tormented with an everlasting itch for things remote. I love to sail forbidden seas.' Up until now, the outer solar system has been a place forbidden to us because of its remoteness. 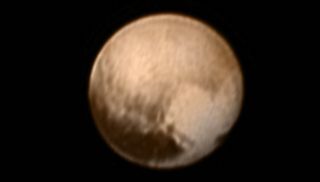 Pluto embodies a faraway, 'mysterious shore,' and New Horizons is the ship that lets us sail those 'forbidden seas.'" On Facebook, Mike Appleby wrote, "I was 9 years old when I watched Neil Armstrong set foot on the moon. I have always been interested in space exploration. Pluto has sat out there for millions of years by itself. This will all change next week as billions of eyes get a close-up look at it." Pluto was discovered in 1930, and was long thought to be a lone ice ball at the outer edge of the solar system. In recent decades, scientists have realized that Pluto is actually a member of a huge family of objects that make up the true outer solar system: the Kuiper Belt and Oort Cloud. The allure of Pluto's mystery is shared by scientists. “I think it's fascinating, because it's the furthest planet, it's the furthest object away from us, it's unexplored," Steve Tegler, a professor of physics and astronomy at Northern Arizona University, told Space.com. Tegler is involved with a project looking to determine the composition of ices on the surface of Pluto. "The first time you visit a planet, that doesn't happen very often. That's pretty exciting stuff, to be able to take first images of its surface and to really get underneath and understand dramatically much more about its physical and chemical properties, structural properties. "To me, I think the fact that it's so far away, it's really at the limit of our ability as a species to get to it, to send something to it. And for me personally, that's what's so interesting about it, is almost everything we know about the universe comes from the analysis of light, whereas we can send spacecraft to objects in the solar system, but [Pluto] is a real stretch. [New Horizons has spent] the better part of a decade in flight, at some of the fastest speeds ever achieved by a spacecraft. We're sort of at the limit of our ability to reach things, to send something there." We can tell you that based on people's Facebook comments, Tegler is not alone in his opinion. For many years, Pluto's status as the smallest planet in the solar system seems to have inspired love from many people who sympathized with its diminutive stature. "It was always my favorite 'cause it was the smallest, like me," Tasha Carrion wrote on Facebook. Jon-Paul Premo seconded that feeling, saying, "I'm small, and Pluto is too. Pluto gets me." Facebook user ISanderson Sanderson wrote, "As the shortest person among all of my friends, I was always fond of tiny Pluto. It's been my favorite planet since I was a wee child and first learned about the planets. Maybe it's the mystery of what it's like, all the way out there at the edge of the solar system, but whatever it is, I've always loved Pluto. I'm so excited that we'll finally get to see what my little friend looks like and learn more about it." And then there are those people who have their own reasons for loving Pluto. Facebook user Lisa E. Jankowski wrote, "When I was in junior high and high school, I read a lot of sci-fi. Many of the books used Pluto as a base for research and/or military. I find it fascinating. [I'd] love to see the surface." On Twitter, Patriot Musket (@Patriot_Musket) expressed love for Pluto "Because it's small and cold. Like an ice cube, which reminds me of bourbon." Astrophysicist Emily Rice (who will be giving a talk about Pluto at the American Museum of natural History in August, and who you can also catch hosting New York City's Astronomy on Tap under the pseudonym "DJ Carly Sagan") said part of the reason she's excited about the New Horizon's mission to Pluto is because of how excited nonscientists are about it. "I love Pluto because *everyone* loves Pluto!" Rice told Space.com in an email. "Having the data come in from New Horizons in the next couple days is a rare opportunity in science when the research results will go directly into the public consciousness, which makes it especially exciting. Already, each new image of Pluto (and Charon! and the other moons!) is all over the news and social media, thanks to scientists and journalists like Alex Parker & Emily Lakdawalla. […] Today, you can ask anyone on the street, and they'll have an opinion about Pluto — this is what I love about astronomy today!" So why do you love Pluto? Let us know in the comments below!